I always tell people I hate onions. One day my boyfriend challenged me. He asked me when I last ate an onion. My reply? Years ago, that's because I hate them ...duh! Recently I was asked about my favourite fountain pen. My reply? I'm not really a fountain pen person. I love the look of them. 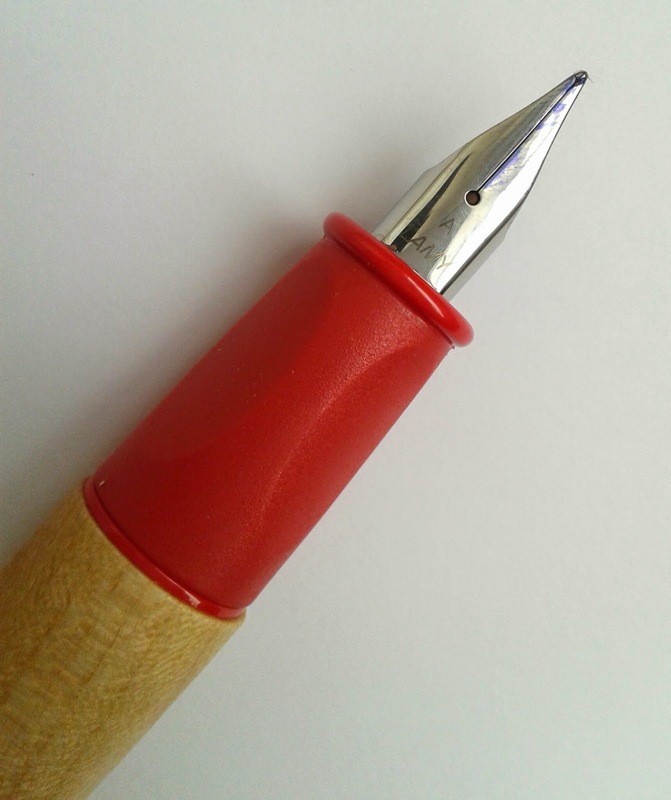 There are some ridiculously beautiful fountain pens out there but they are far too high maintenance. That's why I use rollerballs. 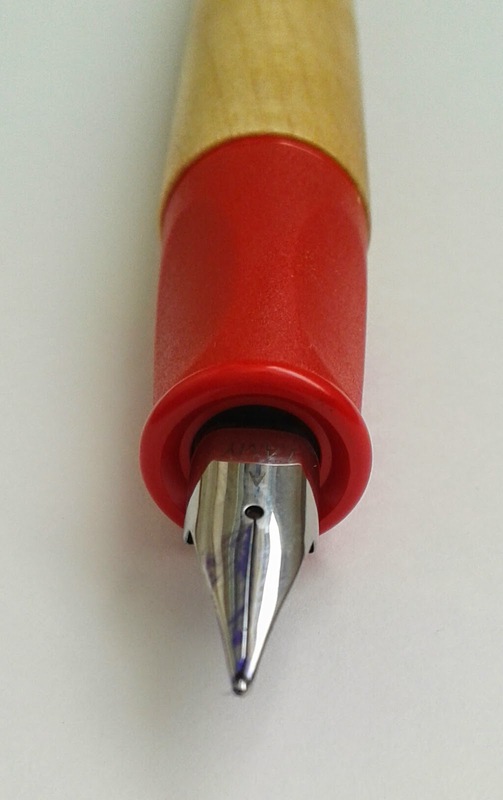 Fountain pens are the divas of the pen world, they need regular cleaning, they can have nib issues and some have really complicated filling methods. Not to mention the fact that they can get expensive. Then came the onion question. When was the last time you used a fountain pen? Which filling method did it use? I realised then that I hadn't used a fountain pen since my school years. I used a cheap cartridge pen which I loved until the nib broke. A rollerball saved the day and the fountain pen ended up in the bin. It's quite sad really. It feels right that I'm starting at the beginning with this fountain pen designed for children. I'm hoping that the fact that this is a childs pen doesn't mean it will be of a lesser quality. Children are like sponges, soaking up information and experiences that will shape who they are. If a childs first experience of using a fountain fails to make a lasting impression then I can't see why they would want to continue using one throughout their school and adult life. A pen that makes a child feel special, a pen that has the ability to enhance handwriting and get children to enjoy writing is a pen that a child will remember. 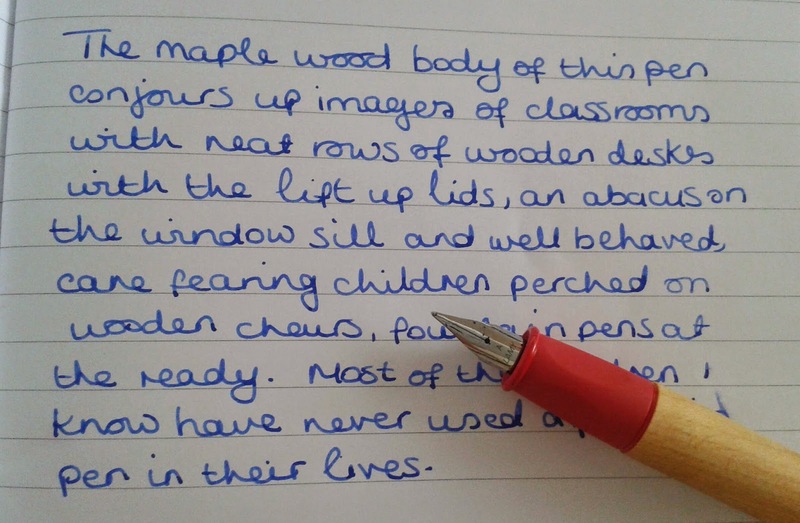 The maple wood body of this pen conjours up images of classrooms with neat rows of wooden desks with the lift up lids, an abacus on the window sill and well behaved, cane fearing children perched on wooden chairs, fountain pens at the ready. Most of the children I know have never used a fountain pen in their life. 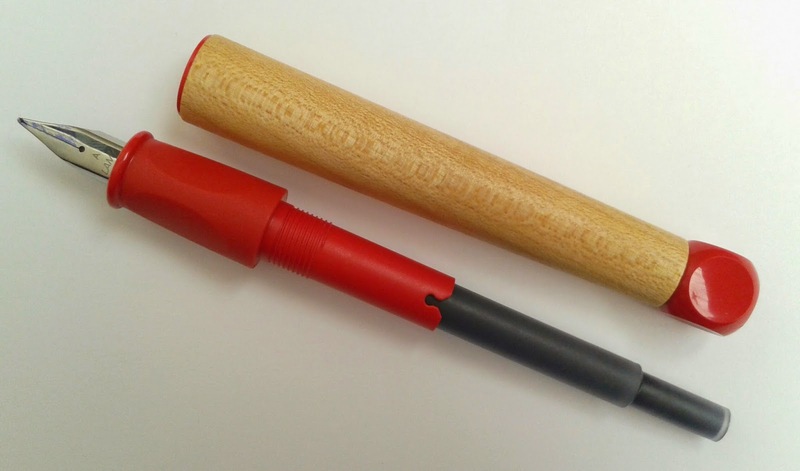 The rubber grip is great for encouraging children to employ the correct grip from the very start. It's successful in reducing any slipping which in turn keeps fingers clean of ink. The shape of the grip really helped me keep the pen in the correct position. After years of only using ballpoints and rollerballs I'm pleased to say that readjusting to using a pen that has a 'right side up' wasn't difficult at all. One of the biggest differences I have noticed between my rollerballs and this fountain pen is how tightly I need to grip the pen. My fingers are so much more relaxed with a fountain pen. I could write an entire novel if I wanted and I know that hunger and tiredness would strike long before hand fatigue. The cube shaped plastic on the end of the pen may look like its just there for decorative purposes but I've discovered that it does actually have a job to do. It helps create an even balance whilst writing and if the pen does happen to roll away the plastic cube will slow the pen enough to give you a decent shot at catching it before it tumbles to the ground. The cube shape prevents the cap from being posted which doesn't bother me but may spark a cap hunt at some point during the school day. So how do I feel about the steel nib? Pretty good actually. It feels sturdy and strong enough to survive the hustle and bustle of a busy classroom as well as an inexperienced user. I was surprised at how little pressure was needed in order to get a decent ink flow. I barely had to press down at all. Once I'd gotton a feel for the pen and holding it in the correct position I was really pleased with the ink flow. I do have some amazing rollerballs that have the same inkiness but the fountain pen just adds that extra sprinkling of character and individuality to the page. I imagine this is one of the many reasons people who use fountain pens never look back. It's true, a fountain pen does feel pretty good on paper. So velvety smooth and easy. I had heard that fountain pen ink is notoriously difficult if used on the wrong type of paper but I found with this pen 80 - 100 gsm paper caused me no problem whatsoever. There is something about writing with a fountain pen that makes me want to take my time. I don't think this pen would allow me to scribble my thoughts hurriedly and scruffily even if I wanted to. 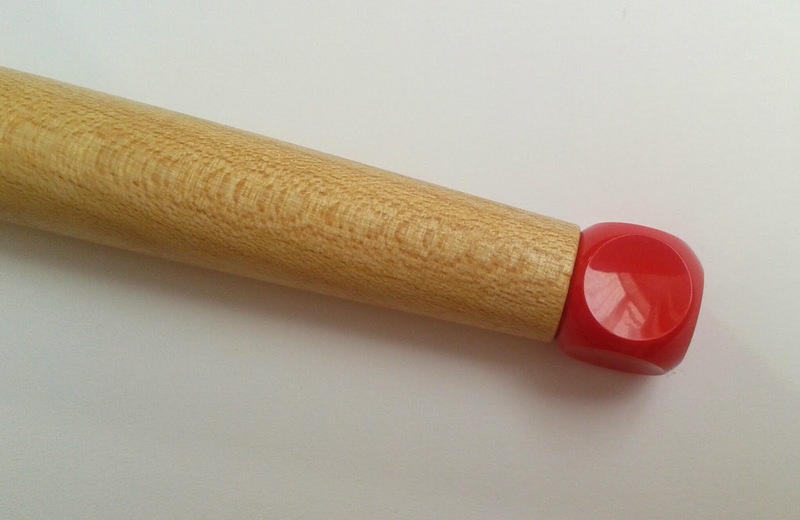 I can see this pen making handwriting practise for children easier and more enjoyable. I'm fairly sure the medium line width will suit the childrens slightly larger handwriting perfectly and it's suits me too. The ink isn't as quick to dry as some rollerballs and ballpoints which may be a problem for left handers like myself. In primary school I was always given blotting paper to help reduce smudging. I feel fortunate as a lefty to have learnt to use even the inkiest pen and very rarely smudge. It may look strange as my notebooks are always at an odd angle but that way my hand is always underneath the words I'm writing and never drags through the ink. One of the things I hear alot from the 'for' fountain pens camp is choice of ink. There does seem to be so much more choice when it comes to colour. I haven't yet experimented with bottled ink but when I do I know this pen is compatible with the Lamy Z24 converter so it won't be a problem. I'd love to try some different shades of green. The pen came equipped with a Lamy cartridge (also available in a variety of attractive colours) which I'm using for this review. The installation of the cartridge was straight forward although it didn't click or pop so I had to double check it was secure before screwing the pen back together. I'm sure with a little more experience, refilling fountain pens will become second nature. The Lamy ABC is missing a clip. I do like my pens to have a clip. Even if I intend to keep a pen in my bag I like it to be clipped and secure so when I grab for it I know it will be exactly where I left it. I can't see the lack of a clip making much difference in a classroom. A lost pen will soon be returned to it's rightful owner thanks to the name tags. 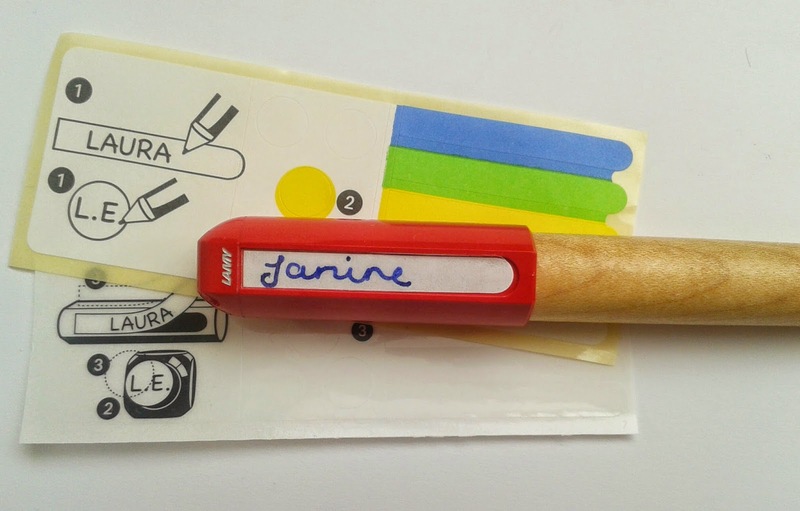 As well as having a choice of colours there is also a clear plastic protective sticker to ensure names stay in pristine condition for as long as possible. I love being able to personalise my pens. It's like gently marking my territory, letting people know that the pen belongs to me. I really must learn to accept that most people are not in the slightest bit interested in running off with my pens. I've surprised myself with how much I enjoyed using this pen. I don't have any other fountain pens to compare it to but this pen is definitely on par with my favourite rollerballs. I doubt very much that I'll suddenly do away with my rollerballs and use nothing but fountain pens. Rollerballs will always be part of who I am, like my favourite dressing gown that I'll never part with no matter how scruffy it gets. However, I'm sure my rollerballs won't mind me making a little room for the occasional fountain pen now and then. Now that I've conquered my initial fear of using a fountain pen I do want to continue on this journey of rediscovery. I want to avoid getting too overwhelmed so one step at a time. My next step is to experiment with ink and I can tell you, I have been invited to take part in something very exciting, and it involves ink. It's going to be heavenly. Watch this space.